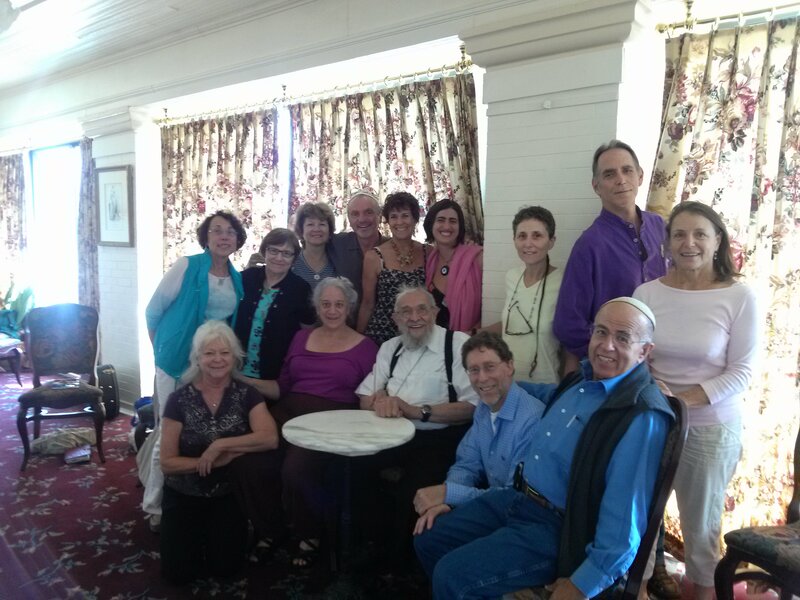 In early August, an intimate and very blessed group of ALEPH supporters gathered at the Hotel Boulderado in Boulder, Colorado to spend Shabbat with Reb Zalman Schachter-Shalomi, Rebbetzin Eve Ilsen, Rabbi Mark Novak, and storyteller Renee Brachfeld. The event was conceived to grow investment in ALEPH while gifting major supporters with a rare intimate weekend with the Rebbe. As one of those present put it, “The experience of Shabbat with Reb Zalman was like warm summer rain soaking in to a field of green grass- gentle and overflowing.” The feeling of joy, deep connection and community was palpable. G!D and Reb Zalman willing, the dream is to make this an annual event, not just for major investors in the work of Jewish Renewal, but also for emerging younger leaders in the movement, to have a panim el panim– face to face- experience with Reb Zalman. Reb Zalman, you are counter-oppressive multireligious thea/ological living and education in the flesh! As a child you deeply absorbed the teachings of mystical Judaism from your European Hasidic origins and continued to grow in its very traditional environment here in the United States. You have learned from Christian and Muslim mystics as well as from Buddhists and Hindus, the ways of the soul’s transformation and the realization. From indigenous peoples you have learned to love and protect the Earth. You have integrated the emerging cosmologies of physical science and experienced the transformational methods of the social sciences. In your life and teachings you’ve harmonized the magisteria of many of the religious traditions with emerging understandings of reality. In your work in ecumenism, you have modeled the dialogue of theology, the dialogue of devotion and the dialogue of Tikkun Olam. You opened to people of all genders and sexual identities the doorway to ordination and restored the rich diversity of various forms of religious leadership. You have taught many of your students how to listen and to counsel people in spiritual growth. You have pioneered ways of experiential liturgies that have helped countless hearts to encounter the divine in themselves and in the universe. You have been a friend to other significant religious and spiritual leaders. You have made available and translated some of the most profound teachings of the Jewish mystical tradition. Take my disposition and shape it to Your will. Like a darting deer I will flee to You. With song and with dance. All in all, a busy month for our founding rebbe! Yesher koach! Posted in General Interest, Milestones and Passages, Reb Zalman. Bookmark the permalink.